In the past few days, I spent my time browsing online for various home inspirations. I bought some memory foam toppers for my room and i have yet to find a nice case for them. In the meantime, I'm actually getting bored with the way our living room looks like so I thought I should give it a make-over soon. Our plain looking ginger colored sofa needs some upgrade. I can't change it to white color because I don't want to end up preventing not to get it too dirty all the time that's why the old color will stay. 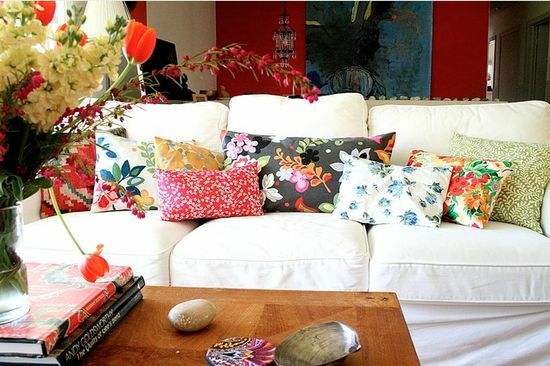 The only thing that came to my mind is to put beautiful accent pillows that can make our living room more lively. The picture above will serve as my inspiration. However, I need to choose some other colors because our sofa is not white. Now, I have to think what colors will match our ginger-colored sofa... hmmm.. let me search for more.